IKV celebrates official dedication of new buildings and a new lab for additive manufacturing. 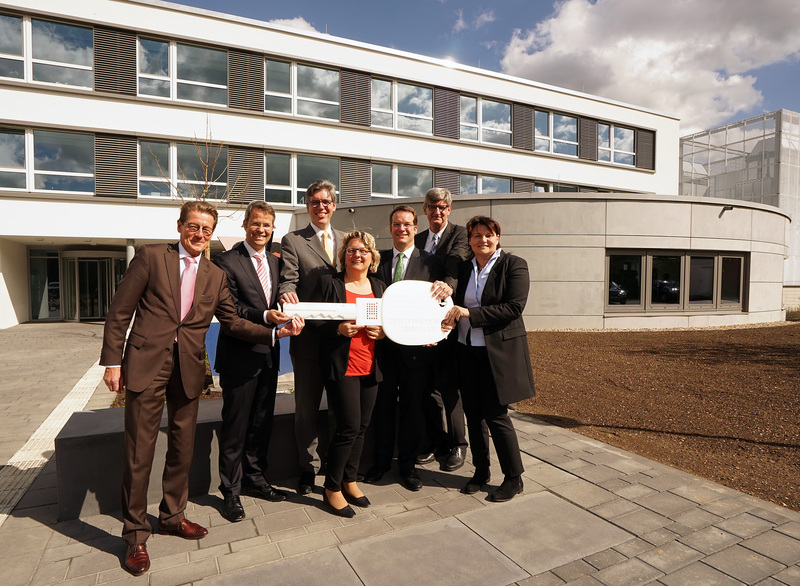 The Institute of Plastics Processing (IKV) in Industry and the Skilled Crafts at RWTH Aachen University recently inaugurated the new buildings at Seffenter Weg 201 on the Campus Melaten. The head of the Institute, Professor Christian Hopmann, together with the head of the Aachen branch of the BLB (building and real estate management authority) of NRW, Jörg Munsch, and the Rector of RWTH Aachen University, Professor Ernst Schmachtenberg, invited representatives from politics, industry and universities to the opening on April 15, 2016. "In Aachen, old established traditions come together with modern technologies. This is due not least to institutes like IKV, which has been making a name for itself for nearly 70 years through modern and innovative research work. The Institute is of special importance for our state of North Rhine-Westphalia, where key technologies such as plastics technology play a major role. They are not only the strongest innovation driver, they are also by far the most powerful economic engine. In no other region of the world do plastic materials play such a key role in the economic development as they do in NRW," said NRW's Science Minister, Svenja Schulze. The fourth construction phase of the IKV building complex, which has now been completed after one and a half years of work, has replaced laboratories and offices that previously occupied 2,700 sq.m. of rented area in the centre of Aachen. "With these new buildings, the master plan to accommodate the whole of IKV on the Campus Melaten has taken a big step forward. The Institute needs modern research rooms that would never have been feasible at the previous site in the city centre," said BLB Branch Manager Jörg Munsch during the handing-over ceremony. He said the Campus would provide outstanding cooperation opportunities between science and industry. BLB Managing Director, Gabriele Willems, said: "The architects have succeeded admirably in integrating the new building into the existing structure. To realise this, construction work also had to be carried out on the other buildings and it was essential not to disrupt the teaching and research activities there any more than absolutely necessary. My compliments to all involved." The investment costs of around 11 million euros for the new building were provided by the state of NRW from the university modernisation program and RWTH Aachen University from its own funds. The planning was carried out by aig+Architekten from Düsseldorf. An important addition to the newly erected buildings is the laboratory for additive manufacturing. This technology, also known as 3D printing, has been a research subject at IKV for a decade or two. In the new pilot plant, IKV can now make use of state-of-the-art FLM machines (Fused Layer Modelling) and a Freeformer from machine builder Arburg. The symbolic key, which was handed over during the inauguration ceremony, was manufactured at IKV itself on the FLM machine. One metre long, 40 cm wide and weighing 1,400 g, it is so far the largest demonstrator part that IKV has ever designed and manufactured. To deposit the 150 layers, the machine was run with maximum stability for 90 hours. Professor Hopmann thanked everyone involved for their part in completing the modern buildings: "The construction makes an outstanding impression through its simple elegance and clear lines. At some points it offers highlights and surprises. The light and friendly atmosphere, not only in the laboratories and seminar area but also in the offices, is ideal for encouraging scientific discussion through encounters with other people – both internally and with our students and partners from science and industry," said Hopmann. Work on the new IKV buildings at Seffent Melaten began in 1992 when the term "Campus Melaten" had not even been invented. It was here that the "Demonstration Centre for Fibre Composites Plastics", consisting of a testing hall and an office, was built. The second construction phase in 1998 comprised an extension of the offices and more laboratories. At this time, the former premises on the Nizzaallee were vacated. 2005 saw the third, much larger construction phase with a second testing hall and a connecting tract to join the two halls for further laboratories. The Extrusion, Part Design and Materials Technology departments moved in, and, at the same time, the former air raid shelter in Försterstraße was vacated. With the completion of this fourth construction phase, IKV has relocated its centre from the Pontstraße to Seffenter Weg. The big wish of the Institute and RWTH is to be able to begin work soon on the final construction phase so that the entire IKV can be accommodated at a single site and thus foster even closer scientific cooperation at this world-renowned Institute.